One of the questions that I’ve receiving from my readers frequently as of late is how to hang curtains – correctly. There’s a few simple things you need to know so that your curtains and room will look their best. Once you follow these general rules, you’ll be all set in this stage of your decorating journey! 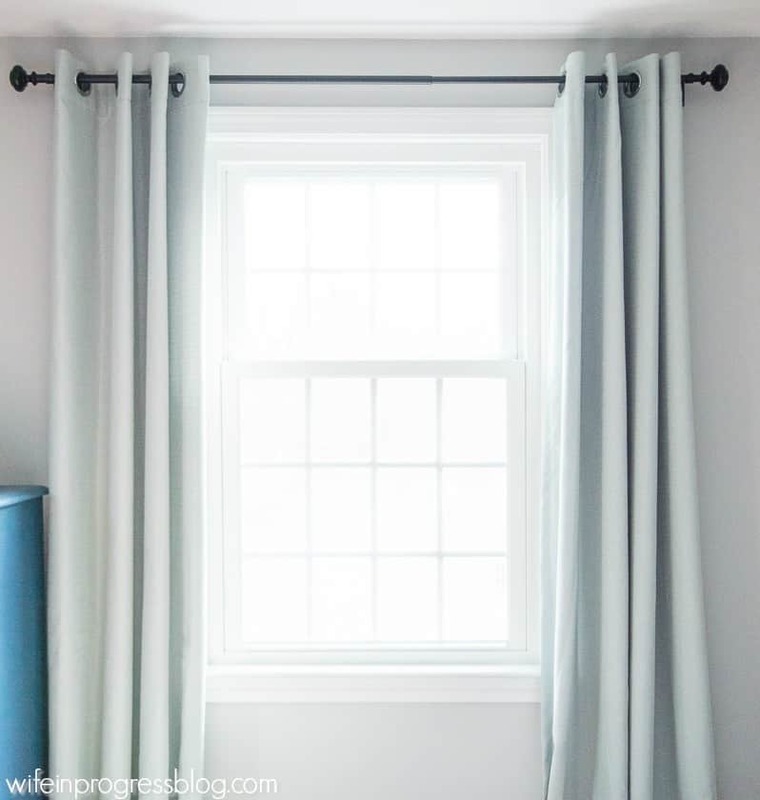 Hang curtains 4 – 8 inches above the window molding. This visually adds height to your room. Even in a room with low ceilings, hanging the rods a least half way between the molding and the ceiling will make your ceilings appear taller. Curtains should not be hung so that they hang over your window. Instead, you want to hang them wide so that they barely touch the side molding or even so that they are directly to the side of the molding. Not only will this give you a better view and more light but it makes your windows appear larger. This is an easy fix with existing rods, all you have to do is extend it 6 – 12 inches on each side. If you plan on closing your curtains, choose a panel width that is two to two-and-a-half times the width of your window. When the curtains are closed, you want them to still bunch up, not be completely flat in front. To figure what length panels you need, measure from the floor up to where you plan on hanging the rod then round up to the closest panel size. Typically, curtains and drapes come in lengths of 72, 83 and 96 inches (or more) as standard. If you have lower height ceilings like I do, you’ll probably need 83 inch panels and for higher ceilings you need the longer panels. For a fresh, modern look your curtains just just skim the floor or hover no more than inch above it. If you want a more relaxed look, you can allow your curtains to pool on inches the floor by 2+ inches. 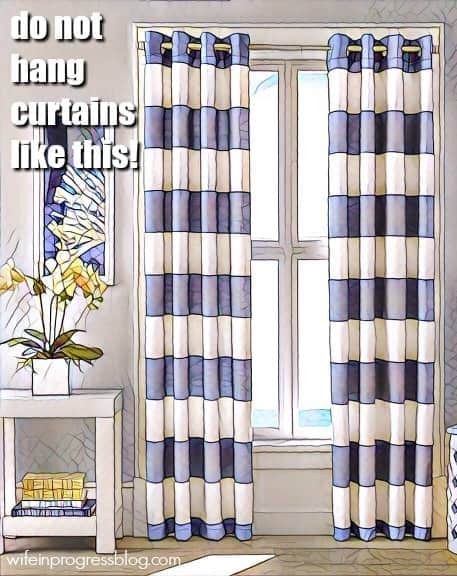 There’s a few simple tips to follow to ensure you curtain rod is hung securely and correctly. Figure out the height. Mark with a pencil. Pay attention to how your bracket will hold the screw, the rod may fall .5 lower than the screw placement. If this is the case, move your measurement up by .5 inch. Use a level to make sure that the measurement on both sides of the window match up. There’s nothing worse than a crooked rod! Determine whether you will need drywall anchors or if there’s already a stud. I like to use a stud finder so that I don’t put unnecessary holes in my wall. If there’s no stud, use self-drilling anchors to secure your screw into the wall . Need a more detailed tutorial? This one from Hey Let’s Make Stuff is pretty detailed. Found this helpful? Sign up for my Free Decorating Email Course to get plenty more home decorating advice! I look at some of the older curtains and curtain rods I installed when we first moved into our house and cringe so much. These are all great tips I wish I had a decade ago!